Is there any way the issue of where exactly the Entry Plug occupies the interior of an Evangelion be reconciled with the dimensions of it? Update: Whoops, forgot to actually display the 10m Entry Plug in that diagram, instead only showing the 12m Plug I was toying with. I have since updated the image to include the 10m Plug and modified the above text to reflect what the image originally showed, and... it just *barely* fits at a 35-degree angle. After looking at some screencaps, have you tried a 20°-30° angle for the insertion? 35°-45° seems too steep for sure, and the angle could be as shallow as 15° - it's very tough to tell the precise angle from the angles we see of the Entry Plug being inserted. I think your placement of the entry plug is a bit off. You can see in the gif below that the spinal armor/plug-hole and containment apparatus actually both raises AND rotates just prior to insertion, making the exact placement and angle of the entry plug rather tricky. Looking frame by frame, and following marks or features on each piece, I see no rotation. There is a sideways shadow movement that might fool you. StrokeMeGoat wrote: I think your placement of the entry plug is a bit off. You can see in the gif below that the spinal armor/plug-hole and containment apparatus actually both raises AND rotates just prior to insertion, making the exact placement and angle of the entry plug rather tricky. Yeah, the plug slot is moving straight up from its locked position, there is no change in angle whatsoever. Regardless, I feel the placement is a bit off. When I've got a bit more time I'll have a go at my own placement. It is nit picky, but we're discussing the placement and its relation to the core here, nit picking is kind of the name of the game. Keep in mind I'm not trying to criticize CL's job here, I'm trying to get the most accurate result. ^ No, I understand, with the constant size inconsistency, it's difficult to understand how the damn Entry Plug fits in the hole. So at least when it comes to rebuild, the entry plugs are indeed so large that they could never fit without being converted to LCL or something. I think it started off mainly as poor implementation of the Unit's design, but it's still an interesting idea to ponder that it'd physically alter Unit 01's appearance. StrokeMeGoat wrote: So at least when it comes to rebuild, the entry plugs are indeed so large that they could never fit without being converted to LCL or something. And those aren't even the only things Eva-13 can fit in there. Insert quadruple penetration joke here. I doubt we're meant to think the plugs convert into another material. In NGE, there are weird intimations that cores link to the Sea of LCL, which is another universe or another dimension of space or something. Entry plugs are inserted into cores. You can see where this is going. They don't have to fit because their mass and volume is accommodated by incomprehensible physics. So I feel super duper dumb for not noticing sooner, but the Evas in the Graveyard clearly have artificial spinal columns, made of the same wires that form the arms. This would kind of suggest their entire central nervous system has been gutted out for the cybernetics needed to make Synchronisation work. Except the Evas have organic brains. That's even more horrifying. It also explains why the Evas seem to be grown in pieces and then assembled: it's more work to scoop the nervous system (and possibly part of the skeleton) out of an entire being than to do so with individual sections before assembly. 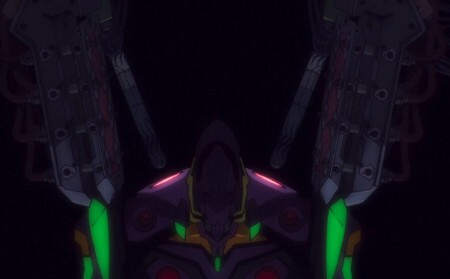 Is there any particular reason why some Evangelions have more than a single pair of eyes? 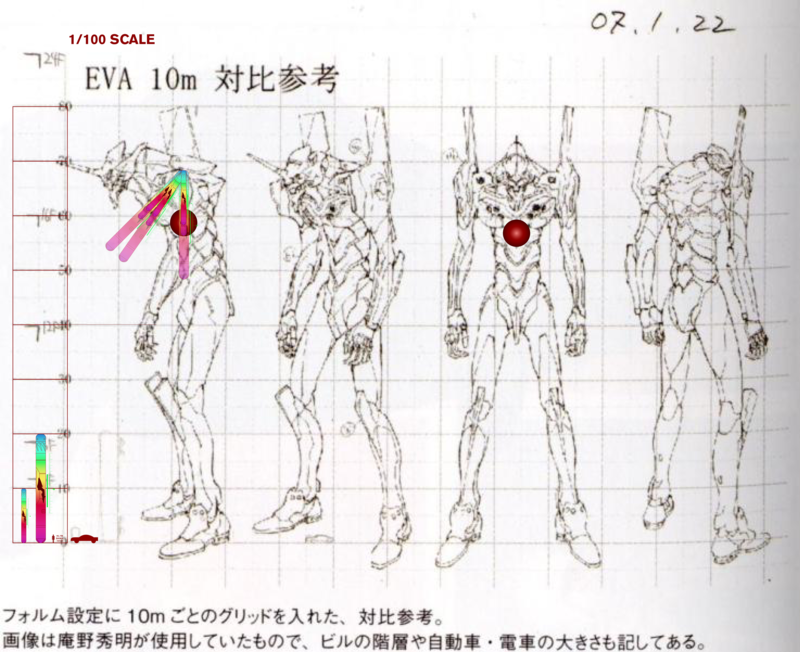 Well as far as we're aware, Evangelions are grown from an unknown sample, but perhaps there's a bit of genetic diversity in the material they're using that results in the differences in appearance between EVAs. VUX#885520 wrote: Is there any particular reason why some Evangelions have more than a single pair of eyes? Eva-02 is the only one that clearly has more than two biological eyes. And the original Eva-02, anyway, is... weird. She's the only Eva with indigo-colored blood and grayish-blue skin. The two production models after her went straight back to something more traditional (two eyes, red blood, etc.). Reading between the lines here, perhaps Eva-02 was an experiment in tinkering with the Eva genome that wasn't considered entirely successful, or whatever success there was wasn't worth the expenditure to get there. Experiment? Don't tell Asuka, she's so proud that her unit is the production type! ^ Perhaps Kyoko did some modifications herself to the genome to improve the Evangelion in some way and they were deemed unnecessary for future units. There's also the fact that while Unit-03 and Unit-04 were both constructed in the US, and with Unit-02 being constructed (or grown) in Germany they had different base samples to begin with. “I would pay good money to see that,” Kyoko counters. Akira wonders if talking to these people was a good idea after all. ^ I came to a similar conclusion in my own fic that different DNA was used to create the Evangelions. Kyoko created the Adam Type A sample, while the American team created the Type B sample. I'm not sure how adding some Lilith to the mix would result in Eva-02's weirdness. If you're able to mix the DNA of something like Adam with something like us, then presumably similar principles are at work, so I will proceed thusly. Lilith at face value has pure white flesh and uses LCL for blood. 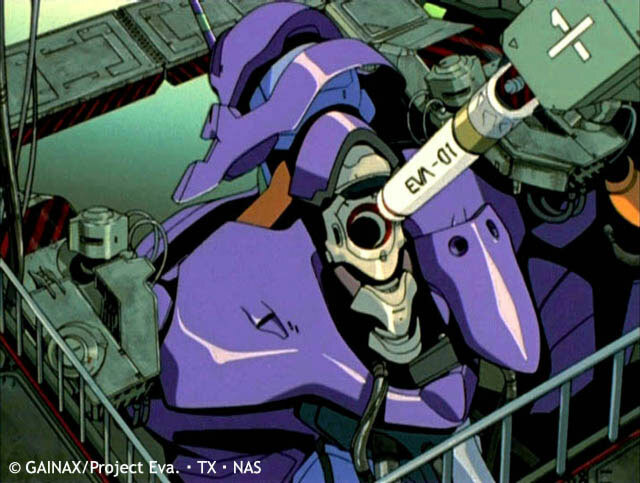 Eva-02 has something in the blood that gives it a DARK PURPLE color. Red+blue=purple, so there's a blue blood additive. How would "Lilith DNA" make a blue blood additive just appear out of nowhere? And it gets worse, since cloning Lilith resulted in something that looks like a dead ringer for Adam, with the exception of pigment abnormalities (which could be explained via epigenetics if you wanted to), with all the expected physical properties, like red blood. Meaning, Lilith's true form is probably something physically indistinguishable from Adam, and splicing their DNA together would basically be the same as splicing DNA from one twin into another twin. You could add redundancies to the information, at best. Normally, this would boost the chances of Very Bad things like genetic disease. The Seeds are genetically engineered, so their genome is probably much hardier, but that makes the decision to tinker with it at all even more perplexing. You're messing with the deliberate sequencing done by people FAR (pun... not intended, but fine I'll take it) more technologically advanced than we are. Tinker with what is, by our reckoning, perfection, and feel very lucky if you get results that grow from the embryonic tissue phase at all. I don't think the deliberate contamination of the Seed genome, as accepted and repeated practice, is really the best approach to take. But, then, the mass production Evas are somehow a thing that exists, so what do I know... If I have any point at all, it's that you should be very wary of the "Lego genetics" meme. Jurassic Park isn't a useful comparison here since Gehirn/Nerv have living tissue samples right at their fingertips; nothing needs to be reconstructed. And yes, I may have gotten the idea from Jurassic Park, but splicing genes together to modify something to make it better (a la Khan Noonien Singh) is a wonderful sci-fi-esque trope that I enjoy.